You can pause the animation or go to a particular year using the video controls in your web browser. Some browsers only show these controls when you click or hover your mouse over the video. This animation shows the locations of Crown of Thorns Starfish (COTS) outbreaks on the Great Barrier Reef over a 30 year period as measured by the Long Term Monitoring Program (LTMP) from the Australian Institute of Marine Science (AIMS) using Manta Tow surveys. COTS spawn huge numbers of eggs (10's millions each) resulting in lots of larvae. The larvae are carried on the ocean currents for several weeks allowing them to migrate to new reefs. These larvae migrate up to approximately 200 km depending on the speed and direction of the surface ocean currents. Once settled these COTS take several years to mature and spawn themselves. When these new COTS spawn the outbreak can then spread another 200 km or so. Once an outbreak has occurred on a reef for several years there is often insufficient coral to sustain the COTS outbreak as it has all been eaten and the COTS die off. Once the reef is in this state outbreaks are less likely as there is not enough coral for the COTS numbers to build up. If the reef is not subjected to another disturbances (cyclones, bleaching, disease, etc.) then the fast growing corals (such as Acropora) will recover in 7-10 years and slow corals may take much longer. The East Australian Current comes off the coral sea and splits in two some where near Lizard island (it tends to move around a bit from year to year). Water north of the split gets pushed north towards Torres Strait and the water south of the split gets push south down the Great Barrier Reef. Much of the East Australian Current travels on the outside of the Great Barrier Reef, but it contributes to the general movement of the water. The Great Barrier Reef from Cairns to Lizard Island is quite narrow and shallow in parts. As a result the water quality is typically lower due to land run off and wind resuspension of sediment. This increases the average nutrient levels and photoplankton which are in turn the food for the COTS larvae. As a result the larvae are more likely to survive in this region. 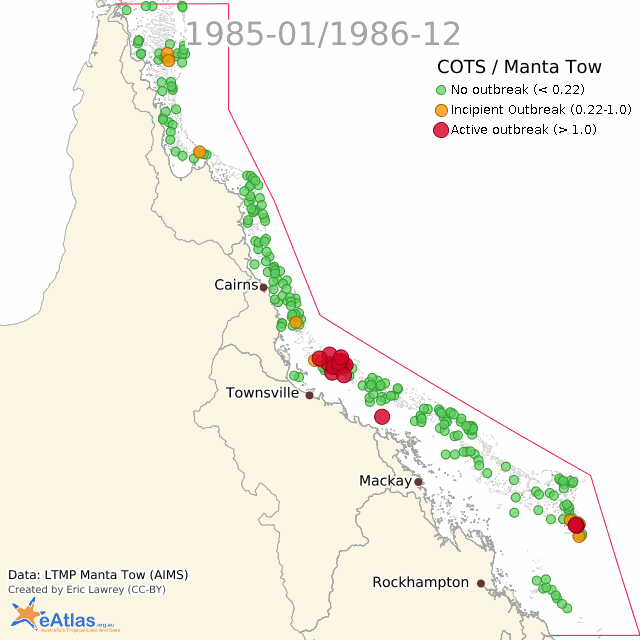 Apart from the main southern wave of outbreaks this animation shows that is a relatively persistent presence of COTS from 1985 to 2005 in the Swain Reefs on the bottom right of the GBR. The reason for this persistent outbreak is unknown, however in this region the growth rate of coral is very high allowing these reefs to maintain high coral cover even with high numbers of COTS. COTS are reclusive animals and so these surveys cannot be used to directly estimate the total number of COTS on any given reef. It has been estimated that the actual number of COTS on a reef is at least 10x that seen by manta tow surveys. However, it has been shown that at a starfish density of 1.0 COTS per tow that the COTS are highly likely to cause a net decline in corals. A density of 0.22 COTS per tow is referred to as "Incipient outbreak" level. The AIMS Data Centre has also produced a similar animation of COTS outbreaks using Inverse Distance Weighting (IDW) to perform a spatial interpolation from the same data.